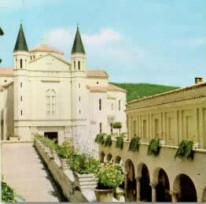 The foundation stone of the church of Saint Rita of Cascia was laid on June 20th 1937, only ten years later, on May 18th 1947, the building was consecrated. The actual aspect however is the fruit of the desire of Pope Pio XII and of the work of first his Eminence Spirito Chiapetta and then of the architects Martinenghi and Calori. Nevertheless we should not forget the economic contribution of so many people devoted to the Saint all over the world and the unceasing work of the abbess Mother Teresa Fasce. The basilica, covered with a white travertine typical of the cellars of Tivoli, presents a Greek cross plan with fours large lateral apses and central cupola dominating the presbytery. The artist Eros Pellini has sculpted on the main portal some episodes of the life of Saint Rita and inside, in Carrara marble, the stops of the Via Crucis. Other modern artists of important fame have participated to the realization of the edifice and the ornaments; the walls are covered with frescos from, among others, Luigi Montanarini, Luigi Filocamo, Silvio Consadori and Gisberto Ceracchini, the sacred "suppellettili" and the main altar are the work of Giacomo Manzù. The remains of Saint Rita are laying nowadays protected by the left gate still perfectly preserved. 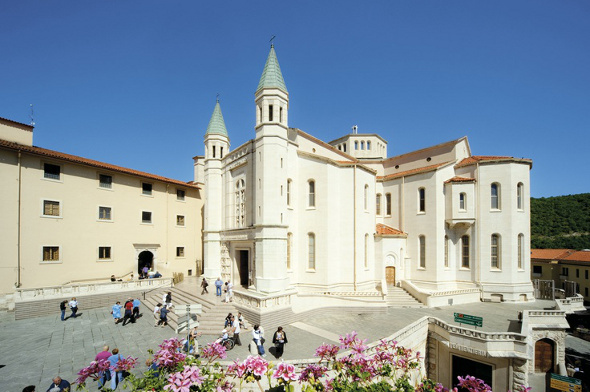 >> Vous voulez visiter Cascia? Consulte maintenant les meilleures agrotourismes à sa proximité. The Saint born in 1381 in the near Roccaporena and baptized with the name of "Margherita", on desire of the father got married renouncing, in a first time, to enter in an Augustinian convent according to what were really her most intimate aspirations. After 18 years of a difficult and violent wedding, her exemplary conduct led the husband to convert himself. In a period of communal battles the husband was killed by the family of the Casciani; "Margherita", in order to avoid bloody and never ending vendetta, forgave her proper compatriots and was welcomed in the Monastery of the Augustinian Sisters of Santa Maria Maddalena. In 1442, during the night of Holy Friday, she received the stigmata from a thornbush of the crown of the Crucifix , that according to the tradition, embedded itself in her forehead. She died on May 22nd 1447, and despite the fact that she was the object of veneration already during the last years of her life, it is only in 1628 that she was beatified by Pope Urbano VIII and only on May 24th 1900 she was sanctified by Pope Leone XIII. Santa Rita is nowday celebrated during the month of May (to coincide with the anniversary of his death) at Cascia with a feast of 10 days (Ritiane Celebrations - Feast of Santa Rita) in which traces the history and tradition of the Holy. >> Si vous avez décidé de visiter Cascia vous devriez contacter maintenant dès agrotourismes et hôtels dans ses environs >> cliquez sur ce lien.